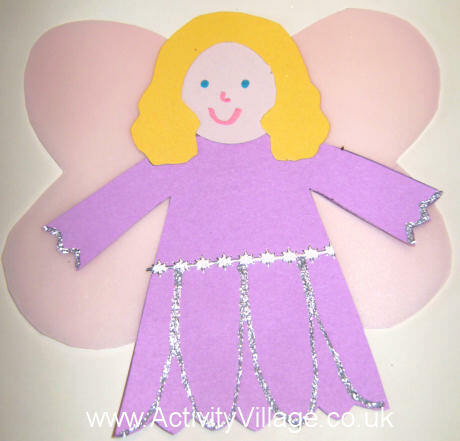 Even the youngest children will enjoy making this pretty fairy collage, and the template provided makes the activity a breeze. You may want to cut out the shapes in advance and leave the decorating and sticking up to the children. You can also find instructions for turning the fairies into finger puppets below. Card - flesh or pink for faces and hands, something appropriate for her hair and any colour you like for her dress. Flowery scrapbook paper would be pretty! Print out our template (see below) on to white card and cut out the shapes. Trace around them onto the appropriate materials and cut out the parts for your collage. You may prefer to leave the hands out for younger children as they can be fiddly. Glue the hair to the front of the face, and use your pens to add her features. Decorate the dress with glitter glue and stickers if you like. Glue the hands to the end of the dress sleeves. Glue the dress to the wings so the neck is about in the middle, and then glue the head on top. To turn your fairy into a finger puppet, cut a piece of card approximately one inch by two inches. Tape one end to the back of the fairy. Tape the other end down close to the first so a loop is formed. Slide your finger into the loop and take your fairy dancing! These gorgeous mini wands are fun to make but take a bit of patience while you wait for them to dry at the various stages. If you are throwing a fairy party, perhaps the party child could make one for each of her guests in advance and pop them in the party bags to take home? These butterfly wings are an easy kids craft for the summer or anytime you are studying butterflies - and they are fun to wear, too! And of course by changing the colours you could make a pair of fairy wings instead. Autumn is a fantastic time to take leaf rubbings and this craft is a lovely way to use them. Maybe it could be used to record a special walk?